Georg Pircher – the new Hahnenkamm-Poster 2017 Born 1966 Bolzano/South Tyrol Georg Pircher completed an expert training course in commercial art with Prof. Viktor Herzner in Innsbruck in 1984, followed by a four-year apprenticeship at Rolandgrafic Advertising Agency in Bolzano. After obtaining his master’s certificate in graphic design in 1989, he founded his own JUNG & C Agency in Bolzano. His strengths lie in logo design, media and advertising campaigns as well as website management, with focus on the distinctive image of each respective product. For many years, Georg Pircher has also been responsible for the PR and sponsoring of Italian alpine skier, Dominik Paris, and tobogganing legend, Armin Zöggeler. This is how Pircher, who accompanies Dominik Paris to the World Cup weekend in Kitzbühel every year, came upon the legendary Hahnenkamm Races and, as he says himself, “ignited with enthusiasm” after his very first visit. He observed the poster competition for several years from the sidelines, before ultimately submitting his own design. „A highly stylised skier in red (love/passion for the sport) is the underlying idea behind the poster design, which evokes a „feeling of deference/respect for the infamous Streif course from a bird’s eye view” says the graphic designer and winner of the poster competition. 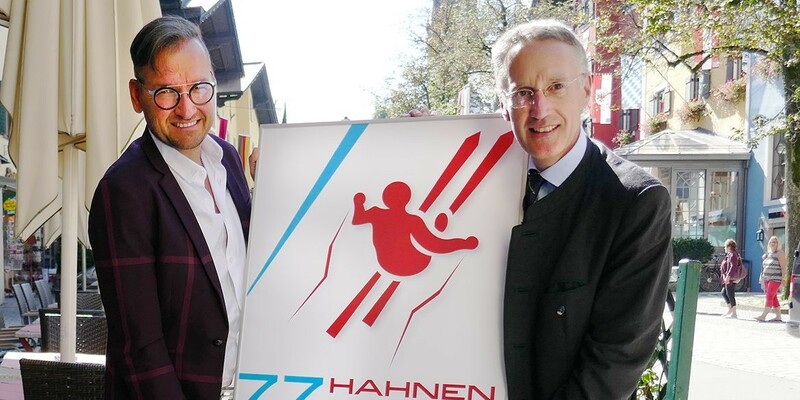 „The jury chose this poster because it represents such clarity in minimalistic style“, explains Hahnenkamm Races Chairman, Michael Huber.